Woman In Water Enjoying Navagio Beach On The Island Of Zakinthos galaxy s8 case by Newnow Photography By Vera Cepic. Protect your Galaxy S8 with an impact-resistant, slim-profile, hard-shell case. The image is printed directly onto the case and wrapped around the edges for a beautiful presentation. Simply snap the case onto your Galaxy S8 for instant protection and direct access to all of the phone's features! 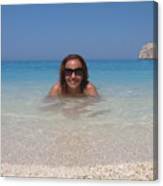 There are no comments for Woman In Water Enjoying Navagio Beach On The Island Of Zakinthos. Click here to post the first comment. Woman enjoying the turquoise water on Navagio beach on the island of Zakinthos. Zakinthos is one of the popular Greek islands for it's long sandy and small cliff sorounded beaches, nature attraction Blue Caves and great and exciting nightlife. Also the island is well known for turtles Carreta Carreta where they leave their eggs for reproduction and this beach has very clean waters.